Dia de Los Muertos is a colorful religious festival in Mexico that is deeply rooted in thousands of years of tradition. This event has a long and complex history that has evolved over time, surviving many successive ancient civilizations and the Spanish Conquest. The Day of the Dead is a profoundly significant cultural event and a unique holiday characterized by special foods and confections. What at first may appear to outsiders a bizarrely macabre celebration is actually an important family ritual that recognizes the cycle of life that is the human experience. 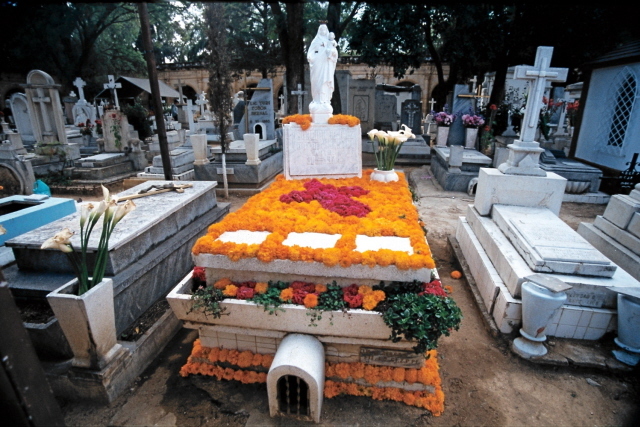 Mexican culture recognizes death as an implicit consequence of life. As in pre-Hispanic times it is seen as the seed of life, a passage to a more authentic existence. Death is embraced in a friendly way, but the Mexican relationship with death is full of subtle irony and mockery. From an early age children make, play with and eat candy skulls and skeletons. Skeleton toys are for both the living and the dead and are used to adorn the offerings for dead children. This may be one reason for the healthy acceptance of death as part of the cycle of life in Mexican culture. Despite the humor that mocks death during this time of year, there is a strong sense of respect for the people’s ancestors. This is particularly so in rural areas with indigenous peoples, where preparations and anticipation of this event are a major preoccupation much of the year. The festival is essentially a private family feast. Although it has a very colorful and festive public aspect at the community level, the core of the celebration takes place from October 31 to November 2, with the extended family. November first is All Saints Day when little dead children are honored, and November second is All Souls Day commemorating the souls of all the faithfully departed. The manner of celebration varies by region, as some families wait in their homes for the arrival of the spirits while others spend the night picnicking in the cemetery (or pantheon) by candlelight. Whether at home or in the cemetery, one of the most important aspects of the celebration is that of the family “offering” or offrenda. Offrendas may take place in family homes, in the cemetery, or both. Offrendas are usually decorated with flowers (usually cempazuchiles, a type of marigold), palm leaves, fruits, or other regional ornaments such as tin or paper skeletons. 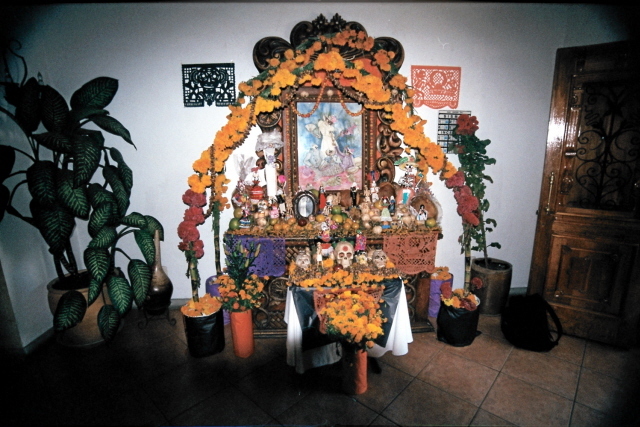 Also present are usually photographs of departed loved ones, figures of saints, favorite foods, personal items, fresh baked bread, sugar skulls or toy skeletons. Copol incense burns to attract dead loved ones and clear the air of any bad spirits that might be present. The family gathers around the offrenda and shares memories of the departed, awaiting their arrival. Their souls are not usually seen, but their presence is sensed. They do not eat the foods left for them, but rather consume its essence, leaving behind positive energy. When family and friends eat the food, it is thought this positive energy is then absorbed and sustains them throughout the year. Disclosure: I am being compensated for my work in creating and managing content as a Contributor for the México Today Program. All stories, opinions and passion for all things México shared here are completely my own. Mexico Today is a joint public and private sector initiative designed to help promote Mexico as a global business partner and an unrivaled tourist destination. This is a very nice description of Muertos. I especially like the explanation of the fact that it is a private and public holiday and that the majority of the celebration actually takes place in the home. Well done!